I also chose this name because it has everything in it – good fats, good carbs, veggies and protein. To give you the lowdown on the salad – it’s actually a spinach salad with sautéed brussels sprouts, quinoa, chickpeas, almonds and avocado with a poached egg on top. The dressing is an orange/lime vinaigrette. This was a bowl of goodness that I didn’t want to end!! Let a salad like this inspire you to look through your fridge and cupboards and get creative! 2. Chop brussels sprouts in half. In a pan over medium heat – add olive oil and garlic and start to cook. Add Brussels sprouts to the skillet and cook without stirring until the undersides of the sprouts turn golden brown, 5 to 7 minutes. Stir to turn sprouts over, and cook other sides until golden brown, another 5 to 7 minutes. Season with salt, black pepper, and garlic powder. 3. While the brussels sauté, cook your quinoa according to the package. 4. Prepare a bowl of spinach, a handful of almonds, a half of an avocado, 1/4-1/3 cup of chickpeas arranged to leave room for the quinoa and brussels. 6. 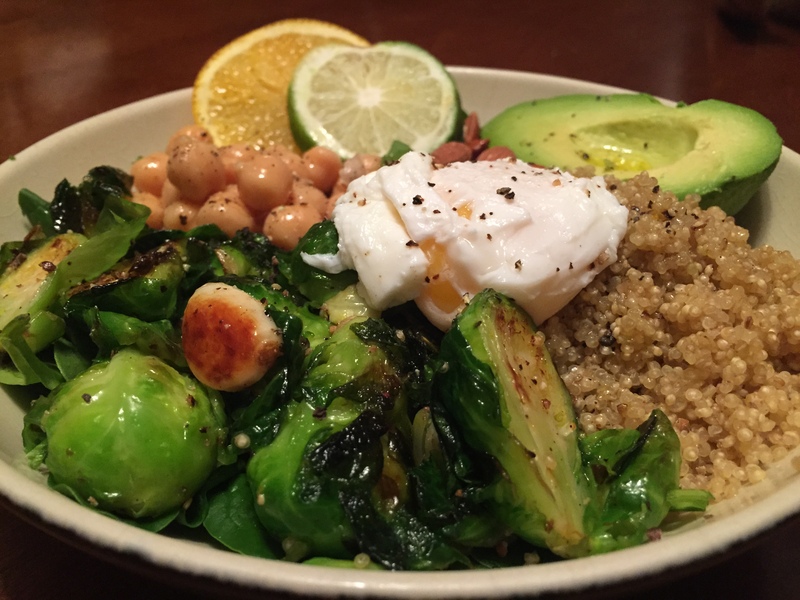 Add the brussels and quinoa to the salad and top with your egg and the dressing. Enjoy! I WILL BE TRYING THIS. It’s rare, due to my pickiness, that I like EVERYTHING on a salad, but this one is the exception! Thanks Megan!! It’s rare, due to my pickiness, that I like EVERYTHING on a salad. This one fits the bill – JACKPOT! Definitely making this one. Thanks Megan!!! YEAHHHHH girl!!! I love it! Let me know what you think!! More yummies coming soon! !